Creamy, sweet, smoky perfection — this chipotle sweet potato mash is a unique and delicious side dish recipe. It goes great with pork or poultry and adds a healthy burst of vitamin A to your table no matter what time of year it is. 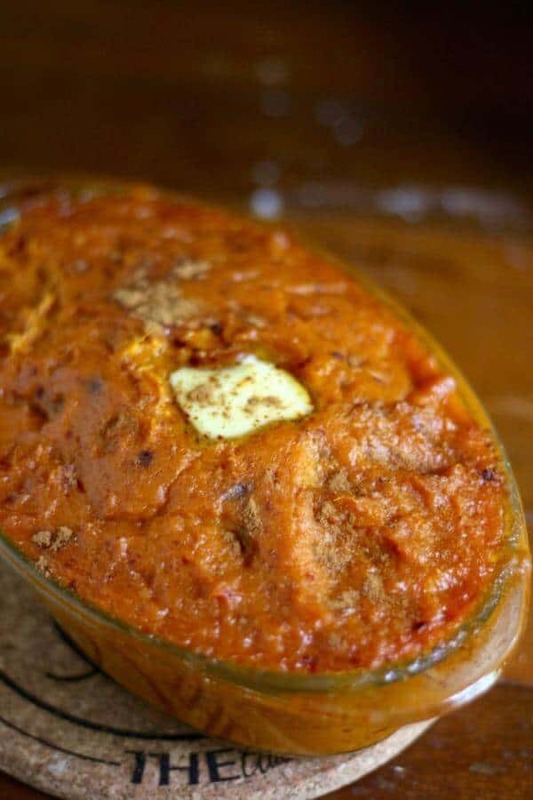 If you are in a hurry click here to go straight to the chipotle sweet potato mash recipe! I know, you probably don’t even want to think about the holidays yet. I know I don’t. After all, it’s a bright, hot July day here in Texas and the idea of heavy holiday food is kinda gross. And yet, here I am perusing Pinterest and adding recipes and decorating ideas to my fall and holiday boards. And that kinda made me hungry for sweet potatoes because you have to have them on the table. Now, a lot of people only eat sweet potatoes during the colder months but they are just as good all year long. That rich flavor goes as well with grilled pork and chicken in the summer as it does with the baked and slow cooked versions in the winter. 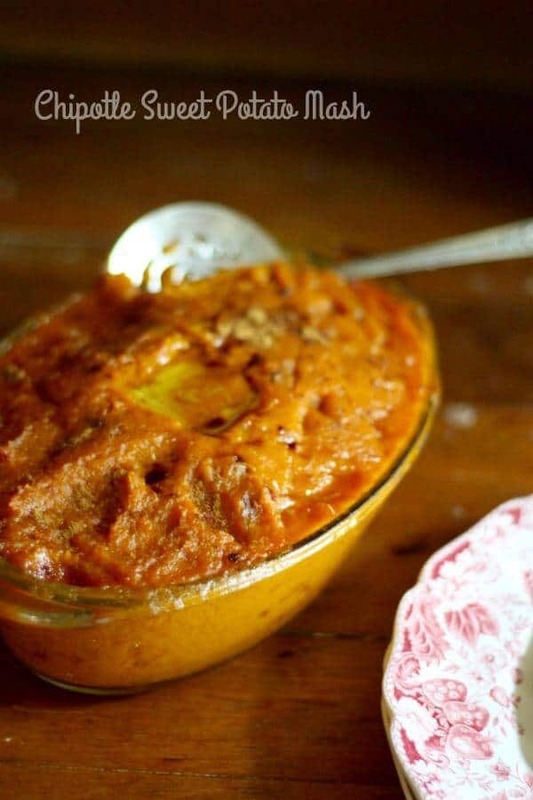 I think this chipotle sweet potato mash is especially nice with grilled meat. Cooking sweet potatoes rather than getting them from a can allows you to actually taste the flavor. I’ve also found several heirloom varieties at our local farmer’s market. That gives you even more of a variety to try. I know turning on the oven in the summer can be awful so consider dropping the sweet potatoes in a slow cooker and letting them go until they’re done, about 5 hours on high or 12 hours on low. A couple of years ago the Thunderbirds were doing a show in Fort Worth during October. My son is on the Thunderbird’s team (he’s finishing up his last year with them now) and he found out he and his wife would have the time to drive over here for a few hours. He had been in the military 10 years at that point and missed all of those family Thanksgivings. I decided to do a Thanksgiving early for the family so we could enjoy it together. All of that to say that kids remember. I swear I’ve made them the same way forever other than a few times when I wandered off the beaten path. Apparently sweet potatoes, at least Thanksgiving sweet potatoes, must be topped with marshmallows. So, these are not the sweet potatoes I’ll be serving during the holidays — or if I do I’ll be making two separate recipes. This chipotle sweet potato mash and sweet potato casserole because… you know… marshmallows! This is the brand of chipotle in adobo I get but you should be able to get it for less money at your grocery store. Here’s that chipotle sweet potato mash recipe. Give it a try next time you’re grilling chicken. Smoky-sweet, and buttery-rich, this chipotle sweet potato mash is perfect any time of the year. It goes with grilled pork and poultry in the summer and the baked versions in the winter. Pierce the sweet potatoes with a knife, place on a baking sheet, and bake until tender, about 45 minutes. Remove the sweet potatoes and allow to cool enough that you can handle them. Cut the potatoes lengthwise and scoop out the flesh into a large mixer bowl. Add the remaining ingredients to the bowl and whip until smooth. Sprinkle with cinnamon and serve hot with butter. Included in Meal Plan Monday – Check it out! This looks so delicious! I’m loving the addition of chipotle! Such a great way to enjoy sweet potatoes all year long! These sound like my kind of sweet potatoes…I LOVE that smoky flavor of chipotles!